Construction Company: Wurster Construction, Indianapolis. Architectural Firm: BSA Life Structures, Indianapolis. 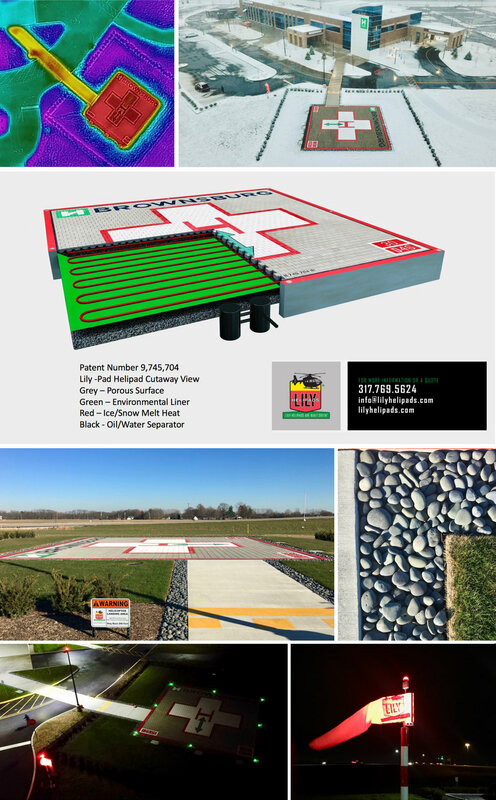 The helipad chosen was provided by Lily Helipads™ and includes an automatic snow ice melt system (SIM) that covers the entire helipad and extends the access ramp from the hospital emergency room to the helipad. The SIM system extracts existing energy from the hospital boilers through a heat exchanger that circulates glycol through a PEX tubing system to keep the helipad and access ways reliably snow and ice free. Aerial photos and thermographic images show the SIM system at work keeping the emergency accesses to the helipad. Being built on traditionally farmed ground in Brownsburg, Hospital owners have strong sense of respect for the land and ecology played an important role in choosing a “Green” helipad design. The Lily Helipads™ LH-46 product is built with a strong “paver” porous surface in top of a geomembrane base that provides capture of any aircraft fluids including spilled fuel or aircraft deicing liquid. Contaminates are separated from clean rain water for safe recycling. The Mexican Beach Pebbles used in the landscape boarder around the helipad not only provide a visually pleasing look but they also act as a natural sound absorber for the “rotor wash” noise emanating from the aircraft. Internally illuminated frangible windsock and pilot controlled LED lighting provide, highly visible references that pilots rely on for safety.